I cannot begin to write about my amazing experiences in Mainz without first thanking my good friend Micha and his parents for welcoming me into their home for nearly two weeks of five-star treatment. Micha, you and your family made me feel as though I was a part of your family for my entire stay. I can't thank you enough for allowing me to stay with you, for training with me, our amazing Fastnacht experience, for our nights on the town and, especially, for ensuring that Sile and Orla had a great time in Mainz. You are the true Werewolf of Mainz and are an absolutely amazing friend! I also need to thank Sile and Orla for making the effort to come to Mainz during my visit to Europe for what was an action-packed three day weekend over Fastnacht! As the saying goes "action speaks louder than words," and your action spoke volumes to me. Your visit was the topper to my stay in Mainz-- I am certain that my Lumpenball and Fastnacht experience would not have been as special without you. I am blessed to have you as my friends, and I look forward to sharing many more amazing Mainz experiences with you-- the 10-year reunion in Spring/Summer 2009 for starters!!! Also, thank you Andre and Jessica for allowing me stay in your home for three wonderful nights. I had a great time catching up, eating Jessica's amazing food, staying up late, and, of course, playing with your boys! Julian and Christoph are going to wreak havoc on the girls when they are older-- the major league pitcher (remember to have Julian throw left-handed!) and the five-star chef! Last, but definitely not least, I need to thank my friend Sigi for being a trooper and coming out to party with us on my last night in Mainz, despite her weakened state, as well as Matthias for taking me to the airport. Hopefully you both will be strong in health for my overnight in Mainz on my way home in July! I arrived back in Mainz on February 13th, revitalized after my amazing three-day trip to La Roche-sur-Yon and itching to begin the Fastnacht festivities... but my desires needed to be tamed, at least for another few days. Micha met me at the Hauptbahnhof, and we headed to his parent's house to drop off my bag before going to our new favorite hangout, Schroeder's in the Neustadt, for good food and drink. Schroeder's is perhaps most famous for its men's bathroom, which is decorated with centerfolds, but it also serves great food at good prices, has a superb atmosphere, and is in an excellent location near the Rhine River. 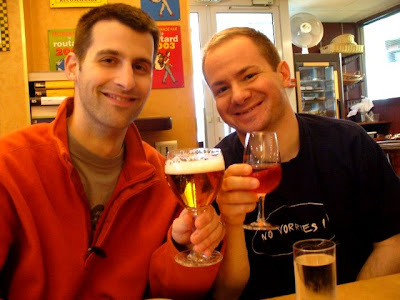 I caught Micha up on all of my fantastic experiences in La Roche-sur-Yon over a delicious, tall Schöfferhofer Dunkles Hefeweizen and schnitzel. Later, the conversation turned to the inevitable-- Fastnacht. In particular, we discussed Sile and Orla's arrival, the plan for the weekend, and our costumes. We decided that the Lumpenball, the student Fastnacht party, on Friday night was definitely a must, and we started to get the ball rolling on our costume ideas... It was going to be a no-holds barred weekend, and we needed to have the perfect costumes. After filling our stomachs full with drink and food, we retired to Micha's for some much needed rest. On Valentine's Day I decided to relax and stay in. I got some e-mailing in and was able to connect with Sile and Orla, which allowed us to solidify a meeting time and point for Friday. It also allowed me to help them with their costume shopping, since Mainz surely had more Fastnacht apparel than London or Dublin, not mention that I had a little bit more time for shopping than my hard-working friends. We also settled on buying tickets to the Lumpenball. Later in the day, I called Jörg, who was all for going to the Lumpenball as well-- Fastnacht was shaping up well... Now all I needed was a costume. The following day that was no longer a worry. I slept in (a talent I had rediscovered in Europe) and headed to the Altstadt-- home of the famous Augustinergasse Dönerkebabhaus. As many of you know, I studied in Mainz from 1998-99. During my life-changing study abroad experience that year, I was lucky to meet many amazing people, including my friends Sile, Orla, and Jessica. I also had the privilege of meeting Roger Embree from Garden City, KS. To make a long story short(er), Roger and I became great friends during our first semester in Mainz. We celebrated every football Sunday by walking to McDonald's for lunch-- Cheeseburger Royal Value Meal, super-sized, aber natürlich-- and listened intently to the Armed Forces Radio Network every Sunday night for our NFL fix. In any case, that year we all came up with amazing, yet sometimes incredibly simple, ideas. One of which was Roger's brilliant idea that every Donnerstag (Thursday) was Dönertag-- simply because they sounded similar. Roger selected the Dönerkebaphaus on the Augustinergasse in the Altstadt as his home each and every Donnerstag. Naturally, once Roger told the owner of the Dönerkebabhaus, as well as all of us, about his idea, we all thought it was fabulous! The idea became a tradition-- one that still stands to this day. Today was Donnerstag = Dönertag! I stepped into our old Donnerstag home and ordered a kebab mit allen (with all ingredients) as if I had been a regular for years. The man (in his early twenties) behind the counter began to prepare his delicious specialty, as I told him the story of how Donnerstag became Dönertag. Of course, he laughed as I told the story! A few minutes passed before I receive my savory meal. As I took my first bite of the heaping lamb-filled dish, I couldn't help but wonder if the ownership had changed hands, as the bread, which was formerly a rectangular shape was now oval. The tender meat, oozing salad, onions and sauces soon erased all thoughts from my mind. Terrific memories shot through my head at the speed of light and my good friend Roger was present with me all over again. As I slowly took the last few bites of my savory kebab, a large group of people entered the stand. I decided to reserve my questions of ownership, etc. for the following Dönertag and thanked the man for his delicious meal and headed toward to the costume shops. The only costume store I knew of during my time in Mainz was a small one near the Schillerplatz, so I headed there to check out this season's flair. Nothing too exciting was going on there, so I asked if there was another shop nearby. As it turns out, the old Saturn, a Best Buy type store, had moved and a costume superstore now occupied its space. As soon as I entered the building, I was in Carnival heaven! I began to check out all of the items-- there were thousands to choose from. An hour had flown by when I looked at my watch. I was scheduled to meet Micha, so I decided to hold off on any purchases until I talked to him about his costume plans... Perhaps we could combine our costumes. I met Micha at the Hauptbahnhof. I could hardly contain my excitement about my new discovery. I began to tell Micha of my costume plans and the store I had found. He had never heard of it, so we headed back to Carnival Nirvana. As soon as Micha entered the store, he knew that we had found exactly what we needed. We both were like kids in a candy store-- spending more than an hour in our new-found costume heaven. We talked and worked on our costumes together. I had planned on dressing 70's style, and he a missing member of the Village People. We bought a few items, including a few things for Sile and Orla, and then we headed to a second-hand store that I had found earlier in the day. While in the second-hand store, I found an outstanding cowboy shirt (Western was the theme of the Lumpenball this year, incidentally) and my plans changed immediately. I was going to be a cowboy. We bought the shirt, an instant classic, indirectly based on the bee-hived store clerk's look as soon as she set her eyes on me in it, and we set off to buy pants and a hat. Later that day we found the perfect pants. The next day I found a child's cowboy hat (it was a bit cheaper than a real one), and I was on cloud nine. Micha, Sile, Orla, and I were set for the Lumpenball! The day before the Lumpenball and Sile and Orla's arrival, I took it easy, in preparation for the big weekend. Micha and I bought the tickets to the Lumpenball-- we received a student discount for all using Micha's ID and later spent all of our savings at a supermarket on Bacardi (two bottles), Coke, and a sixer of Becks (but, of course!). On Friday, I took a run in the morning and met Micha in the city. We settled up our plans with the girls and Jörg after doing some last minute prep work then headed home for a quick rest-- it was going to be a long night. After a short nap, Micha and I grabbed a bite to eat at home then started our prep work on our costumes. I couldn't wait to see Jörg and the girls. It had been more than two years since I seen him and Orla (Sile had come to Chicago last summer). I could hardly contain my excitement. Our highly anticipated weekend was finally here! Jörg swung by around 8pm to pick us up before heading to the girls' hotel. As soon as I saw Jörg, he and I were back in old form. It was as though no time had passed since I had last seen him. Such is the case between great friends. We joked for a few minutes, took some photos and headed out. It took no time to get to the girls' hotel in Jörg's new Volvo Wagon. We were stylin' and ready to party. Climbing floors in the elevator, I was bursting with excitement. I knocked on the girls' door-- it opened and the girls feasted their eyes on quite possibly the three best dressed men in town (well, OK, maybe in the hotel). I gave them a huge hug each-- the party was finally on! Micha and I presented them with our costume goodies, and I began to mix our drinks. Luckily, they both loved the tidbits that Micha and I had picked out for them. We caught up and drank for a little more than an hour before heading to the Lumpenball. As we walked to the Rheingoldhalle, our minds tingled in enjoyment from the alcohol. We entered the massive structure, which was "decked to the nines" for the Wild West Party. There are many rooms in the Rheingoldhalle, each of which was playing different music on this night. There was a main stage downstairs where the headliners played, a techno room downstairs, line dancing and country music upstairs, and even a mechanical bull! We grabbed a beer and walked around to check out all of the ongoings. I couldn't help but stop and dance to country music, being as though I was a cowboy tonight. That, naturally, was followed by a (short) ride on the mechanical bull. The girls, Micha, Jörg and I danced into the wee hours of the morning. I had had the time of my life and was so happy to have spent it in the company of my good friends. It was a great start to the weekend. The next morning the girls met Micha and I at, where else, Eisgrub for Frühstück and beer. Unfortunately, we had just missed the famous breakfast buffet and had to settle for a normal-sized breakfast. I enjoyed a bratwurst and a delicious beer. It was noon, and I was happily drinking, fully recovered from the night before. I could hardly believe how well I was feeling-- neither could the others, as I had been in the worst shape of the group the night before. After filling our stomachs, we headed toward the Rhine River, but not before stopping at a wonderful cafe that Micha had recommended-- the Heilig Geist. The Heilig Geist was erected as a hospital church in 1236 A.D., later becoming an almshouse, before opening as a restaurant in 1863, and has the structure as one would expect to see in a gothic designed church. Needless to say, it is an absolutely fantastic place to have a mid-day pause. After a coffee and basking in the splendid ambience of the cafe, we enjoyed the scenery of the Rhine by taking a long walk on this gorgeous Saturday afternoon. Sile had not been back to Mainz since our heyday in 1998-99 and was ecstatic to be back in our old stomping grounds. It felt wonderful to be with my good friends as we walked the Rhine. We told old stories, caught up, and took in the scenery. Micha and I walked the girls to their hotel so that they could rest before continuing our party atmosphere later in the night. Micha and I headed home for the same. It was well needed and deserved. We met up with the girls later in the Altstadt at Scrooge's, the old Paddy Go Easy, for a drink then headed to dinner at al Cortile, a fabulous Italian restaurant, nearby that was, naturally, suggested by Micha. As we feasted on our insanely delicious meals, it seemed very clear that everyone was in a near state of nirvana. After returning to the clouds again, we decided to head to the Schick & Schön to cap off our great day. The Schick & Schön had been located at the Süd Bahnhof but was closed when the Deutsche Bahn decided to renovate the station, leaving the owners to find a new home. Micha had heard that a new Schick & Schön had just opened that weekend, so he and I were excited to check it out. The concept of the club is simple. The owners (whose surnames are, incidentally, Shick and Schön) by a building, make no changes to it, and offer great music and booze for fantastic prices. (A 500ml beer costs $3.) This building was an old dodgy bar mainly inhabited by older locals, who, on this night, were still in the attendance as the swarm of young people packed the new club. It seemed as though they were lost as the herd of people surrounded them. Naturally, Micha and I were dressed in our costumes to celebrate the big weekend. We found a booth close to the entrance and eased into the night. Many of Micha's friends were also there, so I had the privilege of meeting them as well. Later in the night, Micha and I hit the packed dance floor and wound up partying into the wee hours of the night. The next morning, we met the girls and Jessica, another good friend of mine from my Mainz days, and her two boys, Julian and Christoph, for brunch at the famed Pomp-- home of amazing set breakfasts and freshly squeezed fruit juices. It was the first time that I had seen Jessica and Julian, then an infant, since my last visit to Mainz in December of 2004, and it was the first time I had met Christoph. I couldn't believe just how much Julian had grown. He and Christoph were absolutely adorable, not to mention well behaved. The girls, especially Sile, took to them right away. Micha was also in his element and suddenly found himself playing the role of the good uncle. A great time was had by all, and the addition of Pomp's amazing food and drink added to the wonderful experience. Afterward, the group, including Julian and Christoph, walked Sile and Orla to the Hauptbahnhof so that they could catch their bus to the Frankfurt-Hahn Airport. We had had a spectacular weekend-- probably much better than we ever could have imagined, due in part, to Micha's amazing recommendations. We chatted about our next meeting-- most likely a 10-year reunion in Mainz in 2009 with all of our old friends (Sile was unanimously nominated to chair the reunion committee; I was nominated as co-chair). We embrassed and the group watched the girls' bus pull away. I couldn't wait for our next meeting. Julian and Christoph loved seeing the bus leave and wanted to see the trains as well. They are so smart for their ages! girls, while Micha headed home for some much needed rest. Jessica and I used our time to reminice about our crazy days in Mainz, and, naturally, to catch up on all of the latest news. It felt great to be with the boys as well. There was an amusement park setup in the Altstadt for Carneval, and Julian got to go on a few rides, while Christoph slept. After a few hours of fun in the city, we made our way to Jessica's house, where her husband, Andre, was recovering from an Achilles tendon surgery from a few weeks prior. Upon arrival to the Gläser's house, a hobbled Andre greeted me with open arms. It was great to see him again, even in his current status. We sat and enjoyed some food and drink, caught up, and made plans to meet again later in the week after the celebrations settled down a bit. Jessica drove me back to Micha's. Tomorrow was Rosenmontag, and Micha and I had some preparing to do. The next day Micha and I woke up earlier than usual. We wanted to get a good spot for the Rosenmontag Umzug (parade). It would be the first time that I was healthy enough to enjoy the entire celebration from beginning to end, with the end being a continuous party until the wee hours of the morning. We dauned our worn costumes for their final performances, filled my rucksack with our last bottle of Bacardi, a bottle of Coke, and two plastic CI cups (for nostalgic purposes) and headed for the party. The Rosenmontag Umzug starts at 11:11 on the Kaiserstraße and ends in the Schillerplatz. It had already started by the time we arrived in the Altstadt, but it wouldn't reach us for quite a while, giving us ample time for vorgluen (pre-partying). It was a slightly brisk day, but the sun was cracking through the clouds, and we were well on our way toward warming up. We found a vantage spot for the parade and started to meet our new friends in our area. We had a front spot to the parade and were feeling great by the time the first float made its way to us. The floats during the Rosenmontag Umzug are notoriously politically and humourously themed. Most times the German Prime Minister and/or the U.S. President are posed in a precarious positions and the float is dawned with poiniant sayings. It is definitely one of the highlights of the Carnival season and is a proper precursor to the madness that ensures afterward. Micha and I had finished our Bacardi in no time flat and gradually made the transition to beer, filling our empty stomachs with Thuringers after every pit stop. The mood was perfect, our stomachs were very content, and I was so happy to be sharing this experience with my good friend. Rolling Stones to Michael Jackson. I was elated! I called out to Micha, who was well ahead of me, and began to convince him that we needed to stay. I crossed the street to a neighboring bar and ordered us two beers. The crowd began to grow in size, and we began to dance our hearts out. The party had begun. Everyone in the street was embracing each other, dancing with complete strangers, and enjoying the moment. Before I knew it, a beautiful brown-haired girl had made eye contact with me and had flashed me an equally beautiful smile. We began to dance, enjoying the amazing atmosphere. It seemed as though only minutes had passed and she was suddenly gone. I was a little confused, probably in part due to my current state mind, but I took it in stride. Afterall, I was having the time of my life with my good friend, and that was all that mattered. I looked for my new friend in the swarm of people nevertheless. She was no where to be found. Minutes later another beautiful lady was dancing with me. Rosenmontag was quickly becoming my favorite holiday. I somehow did not change my current atmosphere with this unknown beauty, it would have a lingering effect on my night. I set my sights on her and ran in her direction. In my newfound sober state of mind, I somehow found my good German and asked the girl what the problem was, knowing full well what answer was coming. Of course it was the other lady. I scrambled to explain the situation. I had not done anything wrong afterall and, in fact, had looked for her. Meraculously, I felt as sober as a judge as I began to difuse the situation. I could tell, and knew from her appearance and posture, that the girl, Burcin, was a very sweet person and not the type that one would like to meet at a huge party. Our ensuing conversation confirmed my observations. 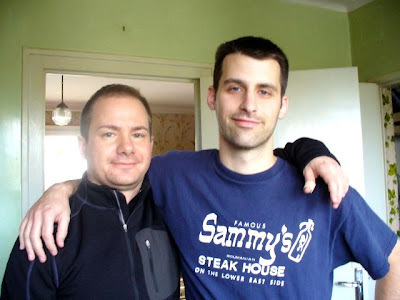 Before long, I had lost my good friend Micha, a moment I am not proud of, but I knew he would be OK, especially since he had already arranged to meet his good friend Martin later in the night. Burcin, a native of Turkey is studying engineering at a renouned school in Darmstadt, and had ventured to Mainz with her friends Victoria and Daniel for the celebration. I noticed that the sun had set-- Burcin and I had been talking for hours, although it seemed as though no time had passed at all. Unfortunately, her friends had enjoyed Rosenmontag more than they could handle and needed to be attended to. So we headed to a Dönerkebab stand for some good food, before I walked them to the Hauptbahnhof. Burcin and I exchanged information, and she graciously let me use her cell phone so that I could contact Micha to find his whereabouts. I was sure he was either at the Schick & Schön or the Red Cat Club. It turned out that he was at the latter. I wished Burcin, who by this time had misplaced her friends (luckily, they made it back to Darmstadt safely), a safe journey home and headed to the Red Cat Club and Micha. Rosenmontag was shaping up nicely. I had never been to the Red Cat Club, but based on Micha's description of it, it seemed like a fantastic new club in Mainz. As I entered the building and made my way into the cavernous establishment, I quickly realized that his assessment was spot-on. The main dance floor was located in what appeared to be an old wine cellar, a perfect location for a club. I quickly found my 6' 5" friend in the huard of people, all of whom were decked to the nines in costume. I made my way towards Micha and discovered that he had, indeed, found Martin. We danced the night away, the perfect capper to a fantastic Rosenmontag. I was happy to have ended the weekend in alive and in once piece. The next day, my near corpse of a body rested. Wednesday came quickly, too quickly for my weakened bones. But Jessica and I had made plans, and I was determined to hold our appointment. She picked me in the afternoon and took me to her home in Schwabenheim, a 20-minute drive from Mainz. After settling in, Jessica thought it would be nice to take a walk with the boys into town so that I could see the town, as I never seen it properly, and also so Julian could show me where he and Christoph attend school. On the way, Christoph decided that he wanted to push his stroller. Jessica told me that it is a favorite pastime of his and that he could push it for hours-- Christoph is a little more than one year old. He looked so adorable as he pushed his stroller into town to the local Aldi, where we would pick up some ingredients for tonight's dinner. Later we walked by the boys' school. I would have to wait until the next day to go inside, as it was closed. Jessica and I decided to surprise Andre by picking up a case (Kiste) of Hefeweizen beer at the local beverage distributor. On this day, the case of beer would replace Christoph's empty seat in the stroller. As we said adu to our friend, Christoph attempted to push his stroller again-- this time completely confused by the weight inside. Jessica and I laughed, as she took Christoph's hand and led him town the street with Julian attached to her other hand. We both laughed as I pushed the beer case baby down the street in the stroller, thinking of how strange passerbys must have thought we were. That night we had a simple, but luscious meal at Jessica's. Afterward, I read a book with maps with Julian and explained to him where Chicago was and where he and his family were going in a few weeks time. (The Gläsers were planning to visit Sacramento in April.) Afterward, I helped Julian, with the help of Christoph, build a castle with his building blocks and later played airport with him in his room. I was having the time of my life as I discovered new German words and taught new English words to the boys along the way. Both Julian and Christoph are bi-lingual and can switch between languages without hesitation. Jessica, a native of Sacramento, CA, and Andre, a native of Bavaria, speak their native tongues with the boys. I was so impressed by how well the boys spoke and was absolutely thrilled when Julian began to speak German to me! It was without a doubt one of the highlights of my trip! The cozy establishment we had chosen was a favorite of Jessica and Andre and was the perfect environment to enjoy a nice glass of wine-- quaint, built of clean, quarried stone, and dressed in old European furniture. Jessica and I enjoyed a few glasses of fine red wine, catching up on our lives in between sips. Before we knew it, the bar was closing its doors. Walking home, Jessica asked me if I had ever tried tequilla with orange slices and cinnamon. I had not. I would soon find out the splendor that was in store for my taste buds. Before endulging ourselves in drink, though, Jessica and I had another mission to fulfill. 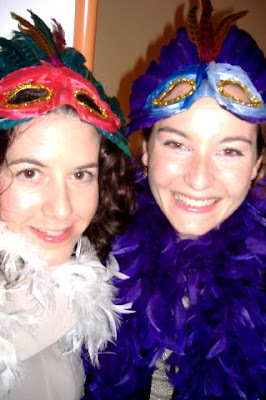 We were going to attempt to call our friend Julie Kuhn, who we last had heard from in 2004 after calling her from Jessica's house in a random last-minute decision. We got online and started our investigation, which had in actuality started weeks prior after Jessica and I chatted online about the prospect of contacting Julie for old time's sake. We had known Julie's place of work and approximate whereabouts but nothing more. Within a matter of minutes, we had all of the information we needed to start making phone calls. (Ah, the splendor of the internet!) Jessica called Andre to see if he wanted to join us for drinks as started our mission. Andre made his way into the kitchen, our supersleuth headquarters. After several calls, we were unable to contact Julie directly, but we had learned that she was currently taking maturnity leave of absense from work. Julie was now married and had had her first child. My how times had changed from our hard living days in Mainz! Jessica and Andre began to make our drinks. We began to chat and later noticed that we had finished an entire bottle of brown tequilla. It was 3am, and Julian and Christoph would be up at 6am. Bedtime had come. up, and Jessica and Andre were exhausted. I had made plans to meet Burcin later in the day for lunch in Darmstadt. In Jessica's state of mind (she, like Andre and I, was still intoxicated from our late night binge), however, there was no way that she was going to be able to drive me home. No worries. I ate breakfast, showered, and caught a bus toward the local train station. It was going to be a long ride home. I arrived in Mainz nearly about an hour later and decided to call Burcin. The weather was gorgeous; in fact, it was perfect for a walk along the Rhine. Burcin had never properly seen Mainz, and I thought that a walk on the Rhine on this glorious day, her birthday, would better choice than Darmstadt. I called her and changed our plans, in turn, buying me more time to change my clothes and look somewhat presentable. I met Burcin at the Hauptbahnhof later in the day and walked the Rhine with her, chatting away the entire time. We eventually wound up at a restaurant in the Altstadt and later a nearby cafe. I really enjoyed my time with her. She was a sweet girl who shared the same dreams of travel as myself. It was an instant connection, and the beginning of what could turn out to be a long term friendship. Soon darkness was upon us, and Burcin needed to head back to Darmstadt to meet her cousin for dinner. I parted ways with Burcin at the Hauptbahnhof and headed to Micha's house. called Jessica and arranged for her to pick me up, as Micha was still recovering from the previous days' events. At the Gläser's, I dug into her amazing schnitzel and extras. I enjoyed a Binding Hefeweizen with Andre and settled into yet another wonderful conversation. We all were exhausted from our tequilla adventure the night before, however, and it wasn't long before we found ourselves thinking about the comfort of our awaiting beds. The next morning, Friday, Jessica, Julian, and Christoph drove me to Micha's house, where we parted ways until our next meeting, which will hopefully be in July for my 22-hour layover in Frankfurt. As I watched Jessica drive off, I couldn't wait to see the boys and her and Andre again soon! Johannes Gutenberg, possibly one of the most important figures of this millennium, was born in Mainz around 1400 and later invented the first reliable metal removable type printing press. Gutenberg's famous Bible is one of the most important books ever produced. As Micha and I made our way through the museum filled with hundreds of antique books from all over the world, I couldn't help but be impressed. I couldn't believe the quality of the workmanship and the preservation of the books. And once I layed my eyes on the Gutenberg Bible, I was absolutely blown away. The size, workmanship, attention to detail, and preservation quality were astounding. I could hardly believe that the book before my eyes was over 600 years old! Of course, knowing that the last Gutenberg Bible sold for more than $5 million USD added to my excitement! Mary is a fellow student of Micha's at the university and was leaving to teach in New Zealand. I had met Mary a few days prior, as Micha and I were on our way to go costume shopping. I was excited to see her off, although I was certain I wouldn't know many people at the party. Schroeder's was packed with all of Mary's friends and the party was in full bloom as we arrived. I got to meet many of Micha and Mary's friends from the university and enjoyed the moment. The party ended with Schroeder's closing, and Micha and I began to talk of what my final day in Mainz would entail. The choices were obvious and, in fact, were no choices at all. The next morning we rose and headed to the Eisgrub, the place my trip had started nearly a month prior, for an insanely scrumptious brunch and equally desireable brew. I was really happy to have Jörg join us as well. Our long standing Eisgrub tradition would continue-- more than 10 years after it had begun! We filled our stomachs to blissfullness. Micha and I would meet Jörg in the evening again at Eisgrub for a beer before heading to the Schick & Schön, where we would cap off my expedition to Europe. Unfortunately, my good friends Sigi and Matthias had fallen sorely ill upon my arrival back in Mainz after France. Matthias was still in bad shape on my final night and was not able to make it out. Luckily, though, Sigi had made a decent enough recovery and was able to meet us at the Schick & Schön for what was a great evening of good drink and conversation amongst good friends. The next morning I received a call from Matthias as Micha and I were heading out the door toward the Hauptbahnhof and the Frankfurt Airport. Matthias had felt bad about not being able to hangout during my return to Mainz and wanted to drive Micha and I to the airport. It was a great idea and would give us at least a few hours to hang out and catch up! We met Matthias near the Hauptbahnhof and weathered the stormy drive to my final destination. Upon arrival, we discovered that my flight was delayed by five hours. My good friends stayed a few hours to keep me company, but, alas, they, understandly, could not stay the entire duration of my delay. I embraced them both one last time and made plans to meet them in July. My trip would end with me listening to my iPod and wandering about the Frankfurter Flughafen, attempting to find ways to help the time pass more quickly. At last, it was time for me to board the plane. I was leaving Germany a very happy man, one who had experienced a better than anticipated trip in a qwest to spend a lot of quality time with my good friends in Europe. I had accomplished my goal and could only help but leave Frankfurt behind with a large smile on my face and thoughts of making the most of my upcoming 22-hour layover in July with them. My flight home was uneventful. Upon arrival, I discovered that Chicago was much colder than Frankfurt, and I had found myself drastically underdressed. I was happy to be home again and could not wait to tell my family about my trip. I was departing for Kathmandu a mere three days later and could already feel the stress building from the long days that were quickly approaching. I knew that my delay in Frankfurt would most likely mean three very long days. My Mom arrived within minutes of my arrival. I kissed and embrased her, full of excitement and energy. We sped away for home, where I would be greeted happily by my sister and uncle and share my stories and news with them. Jörg and I clowning around before going to the Lumpenball. Sile and Orla looking fabulous in their hotel room before the Lumpenball. Micha and I at the Eisgrub the morning after the Lumpenball-- in good form, I must say! Micha, Orla, and Sile at the Heilig Geist. Sile and Orla walking near the Rhine. Jessica and her son, Christoph, at Pomp for brunch. Sile and with a choco Christoph at Pomp. Micha helping Julian play with his toys at Pomp. The gang walking Sile and Orla to their bus. The girls and I before their departure to Frankfurt-Hahn Airport. Julian playing on a twirling wheel near the Altstadt. Christoph pushing his stroller-- a favorite pastime-- to Aldi. Julian on our trip to Aldi. Julian playing catch with me. Jessica and Andre will be fielding calls from major league scouts soon for this up-and-coming European flame-thrower! Jörg out of costume-- looking like a million bucks. Jörg and I goofing off at the Eisgrub. Me at Eisgrub-- sad to be leaving such good beer and Berghard Kühn. Matthias and I at the Frankfurt Airport. Bonjour from La Roche-sur-Yon in Western France, possibly famous only for being the residence of my good friends Nate and Alex. After a short return to Mainz from Copenhagen, I headed to Nantes, France via Ryan Air on Saturday, February 10th, where I promptly missed my train by a matter of seconds to La Roche-sur-Yon. "It's a good thing I have Nate's number to warn him of me arriving four hours later than anticipated," I thought to myself. Now all I had to do was buy a phone card. "Thankfully, Nantes is a large city, so the convenient store clerk in the train station should understand English," I said to myself. Wrong. Not only did she not speak English (it was also my fault for not knowing French too, I might add), but the cheapest phone card they sold cost $15 USD. "Just what I need for a 5-minute phone call," I snickered. After successfully navigating the French call-back phone card system-- a feat that only took 15 minutes-- I was finally able to call Nate to warn him of my delay. The anticipation of finally being able to speak to my good friend after nearly five years had reached near agony as I carefully dialed his digits. I slowly dialed the last digit and began to think of something clever to say to my friend-- an old catch phrase perhaps. I held my breath as the phone went silent for what seemed like forever. "The phone number you are trying to dial is not reachable," said the lady on the other end of the phone. "Had I dialed the number correctly?," I wondered. I dialed again. The same response. "Perhaps he is on the Internet," I said to myself. "I'll try again in a few minutes." I wondered what arrival time I had given my friend in my last e-mail. Would he really have to wait the more than four hours until the next train arrived? The answer would soon come... I decided to take a quick stroll around the area next to the Nantes central train station. I visited the city's famous cathedral and Chateau of the Duke of Brittany. Nantes seemed to have a lot to offer. I practically leaped into my long lost friend's arms as I gave him one of the biggest hugs anyone could possibly give. We were finally together again after what seemed like a decade of absolutely no contact. But, alas, the time seemed to be non-existent as we began to catch up on lost time. So seems to be the case between good friends. After a 20-minute brisk walk to Nate's abode, I greeted Nate's wife Alex in nearly the same fashion. Dinner was on our minds, however, and we quickly headed back into the city after dropping my bag to have what was to be one of many French delectables we devoured during the course of my three-day sojourn to France. Upon arriving at the Napoleon statue, located in the square that holds La Roche-sur-Yon's only other tourist attraction, the cathedral, we met Nate and Alex's friend Matt, a fellow teacher from Pittsburgh. A la Ferme was the restaurant of choice that evening. It came highly recommended by the group-- the only problem? They were expecting a large group later in the evening, and we only had an hour and a half to finish our meal-- a feat for any local, but not for us Americans! Alex graciously translated the menu and made a few recommendations to me. I decided to order the tartiflette. When my main course arrived, it was at that point that I had a revelation. I was in love with French cuisine and my stay with Nate and Alex was going to be far better than I ever could have imagined. As I salivated over the bowl of cheese, potatoes, and meat that sat in front of me, I debated how long it would take me to want to start to learn French. As I took my first bite and accompanied it with a sip of white wine, I thought to myself, "not long." After finishing my meal in what seemed as though a matter of minutes-- we were being rushed, of course-- we ordered our desserts. I chose the ice cream sundae, as the restaurant no longer had tart tatin, another French specialty recommended to me by Nate and Alex. Needless to say, I was not disappointed. The sundae was easily one of the best I had ever tasted. As we finished our desserts, the expected large group of people arrived-- perfect timing. We headed to our next locale-- a bar where many of Nate and Alex's friends were planning to meet us. When we arrived at the bar, nearly all of Nate and Alex's friends were already there, each welcoming me graciously to join them for drinks. Nate had a craving for cognac, so we ordered two and found a place near the action. As our calm debate cooled, we found ourselves separating from the group and catching up on the past five years. It felt so good to be in La Roche-sur-Yon with my friend and his wife. Alas, our good time came to an end when the bar we inhabited became over-crowded and smoky. Our party decided to leave, and we all went our separate ways-- just as a torrential rain began to fall. Strangely, however, walking in the rain seemed like a good fit to evening. The next day I awoke to the sun shining brightly through Nate and Alex's curtains and to my friend's suggestion that crepes would be a good start to the day. How could I resist? After breakfast, I decided to go for a run, which Nate thought was a splendid idea, so he joined me. I had started to run again for the first time in over ten years while I was in Denmark in preparation for my trip to Nepal. My progress had started slowly and this day was no exception. As Nate and I began to run, the sun shone through the partly cloudy skies, as if it was welcoming us to join it. I learned that Nate had run cross country in high school (I had run track), but like me, had not run in years as well; however, unlike he, my lack of conditioning apparent. After completing a 20-minute run to the nearby hospital and back, we showered and all took a walk into the city. We caught up more on the on-goings of our mutual friends and respective families before finding a cafe to settle in for a drink and, hopefully, a tart tatin. Nate and Alex found a traditional cafe that on this bright Sunday afternoon was filled with couples and families beginning their early dinner sampling. One couple was busy eating a heaping plate-full of escargot, while others, like us, were simply ordering drinks and dessert. 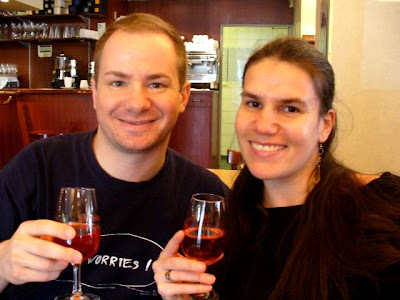 Alex suggested that I try a traditional French drink, kir, as Nate sampled a Kronenbourg. We were also in luck-- the cafe served tart tatin, ala mode no less! As our drinks arrived, we toasted to our friendship and to being together again after all of these years and Nate toasted me and my upcoming trip. As I took my first sip of kir (I had made it before but never tasted it), my tongue began to tingle as I tasted the slight bitterness of the white wine, followed by the sweetness of the creme de cassis. Yummy! The tart tatin arrived a few minutes later, and I knew I was in for a treat. I could smell the caramel and apples stewing inside, as the French vanilla ice cream slowly melted next to it. As I took my first bite, my eyes couldn't help but roll themselves backward into my head. The crispness of the sweet apples mixed with the bronzed caramel and cool, creamy ice cream was absolute heaven with every bite. "When could I start to learn French again?," I thought to myself. As I slowly savored each bite, Nate turned our conversation to dinner; food, the staple of our existence and the profound theme of my visit. Nate mentioned that he was working on perfecting his Boeuf Bourguignon recipe, a traditional French stew consisting of beef, garlic, onions, carrots and potatoes, cooked in burgundy. I could hardly wait to partake in dinner, even though I had just finished dessert, as Nate described how the meal was made and, more so, how it tasted. We slowly made our way back to Nate and Alex's apartment, our stomachs filled with delight and already dreaming of the splendor yet to come. Nate is the designated cook in his marriage, while Alex ensures that everything is cleaned afterward. As with breakfast, I found myself in the kitchen with Nate, learning how to make this French masterpiece. I found out that Nate had been to a restaurant in Copenhagen the previous summer, where they had been visiting Alex's relatives, and had discovered the best and most tender Boeuf Bourguignon of his life. He asked the chef what his secret was. The answer: the beef had been simmering for a few days in the burgundy. We did not have that type of convenience at our disposal, but we sure made the best of with what we had. As I helped to cut the ingredients, Nate was busy preparing everything so that it was just right, while Alex was setting the tone for the night-- jazz. As Nate added the final ingredient to the stew-- the burgundy-- we all waited in increasing anticipation as the aroma from the beef and vegetables simmered in the sweet burgundy. After three hours of constant temptation, it was time to devour our creation. As Nate placed each bowl of delight in front of us, the steam from the stew rose and our noses met it blissfully. One could smell all of the simmered vegetables inside, but, moreover, the sweet, yet strong flavor of the beef and the burgundy. As I took my first sip of the deliciously sweet beef broth, one of the best I had ever tasted, I had hardly finished it before my craving for trying the beef had overcome me. "If the broth was this good, just how tender must the beef be?," I thought to myself. I took my first nibble of the beef-- so tender that it nearly split in two pieces before I was able to place it into my now watering mouth. Wow. I love North American stews just fine, but this was like no other. Perhaps it was the difference in the texture of the vegetables or, more probably, the burgundy, but I when I tasted the splendor of the meal, I could do nothing more than sit in my chair quietly, look at Nate, and shake my head to acknowledge my state of pure ecstasy. I was absolutely blown away. After devouring several bowls of Boeuf Bourguignon, along with our fair portion of baguette, Nate brought out a small salad and dessert-- a traditional French cheese platter. I am a cheese-lover and always have been, by American standards, mind you, and I know that European cheeses tend to be hit or miss with me, but I wanted to each selection, regardless of appearance and potency. Nate's selection pushed me to the limit, ranging from a mild Camembert to a blue cheese (not a favorite of mine) to a potent chevre cheese, which was actually quite tasty, although the green mold that had been growing on it was not. The remainder of the evening Nate, Alex, and I chatted and talked about the day's events. I was quite impressed by Nate's culinary skill and expertise and was very thankful to be in my good friend's company. On Monday morning I left with Nate to accompany him part way on his daily walk to school. I wanted to buy my train ticket so that I didn't have to worry about it the next morning, my departure date. After an unsuccessful purchase, I headed back to my friends' apartment to catch up on some e-mail and spend a little time with Alex, who had the day off. Nate and Alex are both teaching English this year to elementary school children in La Roche-sur-Yon. Both are working mainly with underprivileged and/or misbehaved children, although Alex's students come from various types of non-traditional family backgrounds. In their spare time, however, both Nate and Alex are working on their respective writing projects. Nate is working on a fantasy trilogy and is nearly complete with his first edition. Alex is working on a semi-biographical project that incorporates her family's history and Venezuelan heritage. She has been working diligently for months interviewing her aunt in Venezuela in order to complete her research. On this Monday, I had the opportunity to see Alex at work, compiling her massive amount of data. I couldn't help but be impressed. I met Nate for a quick lunch near the Napoleon statue-- baguette sandwiches, what else! He was having a rough day in class, and I think the break helped to ease some of his tension. Naturally, we talked about dinner as well and decided that French onion soup would be on the menu. I met Nate at home after his classes were complete and went shopping for the ingredients, along with a few bottles of Bordeaux wine ($2 USD/bottle-- Vive la France!). In a flash we were at home busy chopping up the ingredients over a now open bottle of Bordeaux. Soon the ingredients were simmering, and I remembered that I had put off my run for the day. In a semi-drunken stooper, I informed Nate that I was going to take a quick run, to which he insisted that I have another glass of wine; I am sure to compel me not to go. No problem. I sipped the glass empty then dashed out the door, running full steam ahead toward the train station-- a slight up grade the entire way. In fifteen minutes time I had reached my destination, exhausted with delicious wine pumping through my veins. I bought a few postcards for my mutual friends of Nate and headed home. In ten minutes I was back. As I opened the door to the apartment, I smelled only the sweetness of the soup simmering on the stove. After I had changed, dinner was ready to be served. My stomach and I could hardly wait! As with dinner the previous night, a delicious fresh baguette accompanied our French onion soup, but it found itself a distant second to the main course. As I dipped my spoon into the golden brown broth of the soup, the tender onions limped over the edge of the spoon, many falling directly into its place of origin. I could smell the sweet caramelized broth and onions as I took my first sip. "How can something so simple taste so good?," I asked myself as I tasted the delicate meal. All that was missing was the bread bowl that is customary in the States, but that was not important at this point in time. I could only focus on the mouth-watering food and the need for me to get the recipes from the prior days meals (or the need to become Nate's assistant chef!). After finishing a few bowls of soup, Nate reminded me that leftover Boeuf Bourguignon awaited us and stated that it was going to be even more tender than the night before due to it having marinated overnight in its juices. Wow-- was he right!!! We ate ourselves full in absolute delight with soup, stew, and baguette before taking on our traditional cheese plate from the night before. Dessert was followed up by Shakira and a best of three game of horse- indoor Nerf style. A nightcap of multiple rounds of our favorite 80's videos on Youtube followed. The next morning Alex awoke to give me a proper send off, while Nate accompanied me to the train station. We bought my ticket, had a delicious cup of espresso, recapped our amazing visit, embraced and I was off to Nantes, hoping that I would see my good friend again sooner rather than later. Due to the irregularity of the trains between La Roche-sur-Yon and Nantes, I was able to take a few hours to see the lovely Jardin des Plantes, one of the most famous botanical gardens in all of France. Luckily, it was a gorgeous Tuesday morning and all of the flowers were in bloom. As I strolled through the park, I couldn't help but be thankful for the three days I had spent in France and feel lucky to have such wonderful friends. The garden was truly the capper to a splendid weekend. Thank you Nate and Alex for inviting me to France and welcoming me into your home. I had an absolute blast in La Roche-sur-Yon with you! You are truly both wonderful people, and I am so happy to have you as my friends. Good luck on your respective writing projects (and staying sane with the children). Please stay in touch!!! 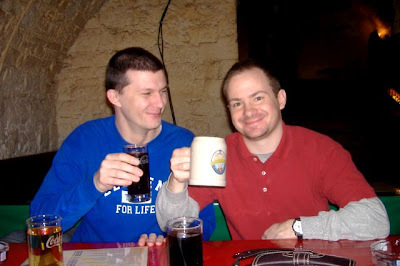 Nate and me on the town my first night in La Roche-sur-Yon. Nate making one of his many delicious specialties- crepes. Nate and I after our run. Possibly La Roche-sur-Yon's only tourist attraction (besides Nate and Alex)-- Napoleon and the cathedral (that was closed during my entire visit). The main attraction in La Roche-sur-Yon. Nate and me enjoying his savory Boeuf Bourguignon with some fine French wine, of course. Nate and me enjoying Kronenbourg and kir. Alex and me enjoying our kir. Nate preparing to dig into his mouth-watering French onion soup. La Jardin des Plantes in Nantes-- one of the most famous botanical gardens in France. A waterfall looking toward the Japanese garden.